I have been looking at SAGA for about 6 months now, it looks like a very innovative game, simple to play, and requires a limited number of figures. I was very attracted. When I look at the other historical periods that I have tried over the last year (WWII, Japanese Sengoku Period), and my subsequent failure to be enthused, I believe the reason is two fold. First the Napoleonic period will always be number 1 for me, but essentially it requires an enormous amount of time to paint armies at the divisional level, and I like painting Napoleonic armies. I have had a real good go at the French, Prussian and Anglo-Portuguese, but also want to paint the Hanoverians and the Brunswickers to start. Because of this I really have little will left to paint large armies in other periods. Another period really needs to be at the skirmish level. Thirty-60 figures aside and ready to go, is what I need. I also need an interesting and well put together set of rules. I have found nothing for the Sengoku period (there is a SAGA mod, but I am really not good with mods, I need a full colour rulebook with all the extras to get me started). For WWII, I based for non skirmish gaming, it was a mistake. The IABSM rules from TooFatLardies look great, but I have to do some rebasing and I am now unsure if I should have gone with 28mm rather then 15mm. Then along comes SAGA, great looking rules and few figures required. But I have to be enthused about the period as well. For me I have to feel the characters to be interested, and for that to happen I have had to read books or see films that have excited me. Richard Sharpe is the sole reason I got into Napoleonics, and look what happened there. Who could watch an Akira Kurosawa film and not want to paint and game Samurai? James Mason as Rommel, all good too! But what about the Dark Ages, well I liked both Bernard Cornwell's Arthurian books (the best by him in my opinion) as well as his Saxon Chronicles. My old mam is from Yorkshire and is of Anglo-Danish stock, so I had some links. But for some reason I was still not being triggered, how could I link it to me. Suddenly it dawned on me, there was a Dark Ages link which was very close to me. I am from western Newfoundland and just north of me was fought one of the most obscure struggles in the Dark Ages.......that between the Vikings, who discovered North America 1000 years ago and who settled for twenty years in Vinland, and the aboriginal inhabitants, a now extinct race. 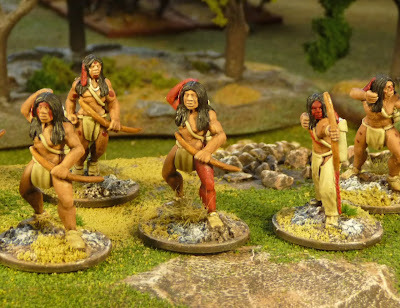 SAGA is a well developed game, but is quite dependent on the research and play testing that was done on each tribe, and none of the initial 8 tribes introduced were still using stone age weaponry, as were the Newfoundland aboriginals at the time of their encounter with the Vikings. And then out of the blue in April, came the news that SAGA were introducing the Skraelings at Salute. Who would have thought it. I was set to go! But how was I going to get these Skraelings, all the information I had at the time suggested that the battle board and the figures were a one-off for Salute and were quite limited. It was a bit late to fly to London. I remembered that Curt of Analogue Hobbies was there, could I some how contact him to pick me up a box. But by the time I thought of this, I realized that Salute was over. Emails to Architects of War, though eventually brought results. About 3 weeks ago, I received the limited edition Skraelings 4pt introduction box with battle board and rules insert. I was set to go. So here we have the first point in my SAGA war band. I decided to start with the levy, so here we have 12 bow armed figures. 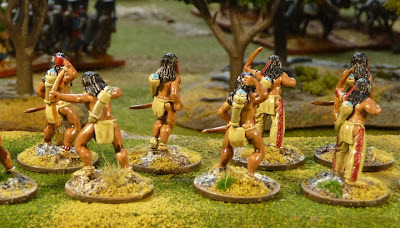 These are the first skirmish figures I have painted. You can see that my usual technique of a white base, with block painting and AP strong dip worked quite well. For some reason, I have held off on applying the dullcote, and I am not sure why. They are quite shiny in the photo but are less so on the table. I also may apply some snow to the bases, but more about that later. Anyway I am very excited about this project and have done an enormous amount of research into the history of the period. I will discuss this further in later posts. I already have finished another 1 pt of Skraelings and 2 points of Vikings, which will be soon posted. I am also in the initial planning of terrain as well as scenarios in and about L'anse aux Meadows. There is a lot more to come! 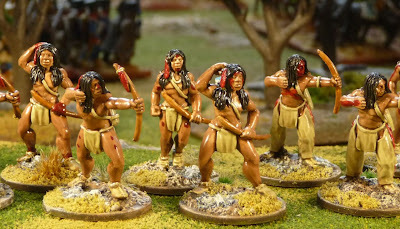 I will include a discussion of who were the Skraelings and why I have painted them like I have. ps Should I apply dullcote matt varnish? Update: Well clearly the advice was to Dullcote. So here we go. They do look better, stay tuned for some Vikings tomorrow. I always matt varnish after the dip as it leaves skirmish figures too shiny I think. I like my minis matt, so i reckon a matt varnish would indeed improve them. Saga is a fun game, quite light but works well. Great looking figures John, I shall be following your Skraeling exploits with great enthusiasm. I think the figures could do with being a little less shiny so I'd give them a go with the matt varnish. Nice figures and interesting subject, any info you could provide re the Skraeling natives of the time etc would be greatly appreciated. Dullcote? Entirely up to you I'd say.. I have always been a devotee of Dullcote over my 40+ years of hobby activities and wargaming. I just recently tried the Army Painter matt spray and Dullcote the King has been dethroned! If you are using the dip, the spray is just as good. The surface of the miniature is rougher than with Dullcote but that is because the particulate matter that cuts the shine is more dense. PS: Go with a matt finish. Thanks everyone, matt it will be. I will add a couple of photos today. Nicely done - shiny or not it's very good painting. I've been keeping one eye on the SAGA developments, but the Skraelings had completely passed me by. I love the idea of these guys facing off against Vikings (and the other SAGA tribes). I look forward to more info on who these guys actually were.